Ingersoll, Simcoe, Stratford, New Hamburg, Brantford, Kitchener, Waterloo and southern Ontario. Pesada Painting are established and trusted industrial painters in the London, Sarnia, Windor areas. As far as the London, Woodstock, Sarnia, St. Thomas, Brantford and Kitchener areas are concerned, you won't find better industrial painters than the team at Pesada Painting. The industrial painters that work for Pesada Painting are thoroughly experienced, knowledgable and dedicated painters that value nothing more than exceptional customer service and quality workmanship. Proudly serving the London and surrounding area in the fields of commercial painting, industrial painting & storage tank / silo painting, we are happy to announce that Pesada Painting is the most diversified industrial painting company around. 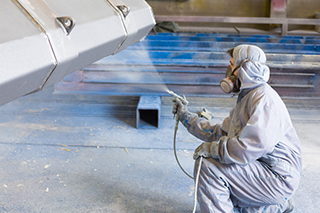 We formally train our industrial painters to the standard of the industry, and ensure that each and every one of our industrial painters is both self-sufficient and capable of working in a team. We are a dedicated team of professional painters with over 35 years experience in commercial, institutional and industrial painting. London, Chatham-Kent, St. Thomas, Sarnia, Woodstock, Leamington, Port Dover, Windsor, Ingersoll, Simcoe, Stratford, New Hamburg, Brantford, Kitchener, Waterloo and southern Ontario. Industrial Painters London is a property of Pesada Painting that provide commercial and industrial painting services in London and southern Ontario.